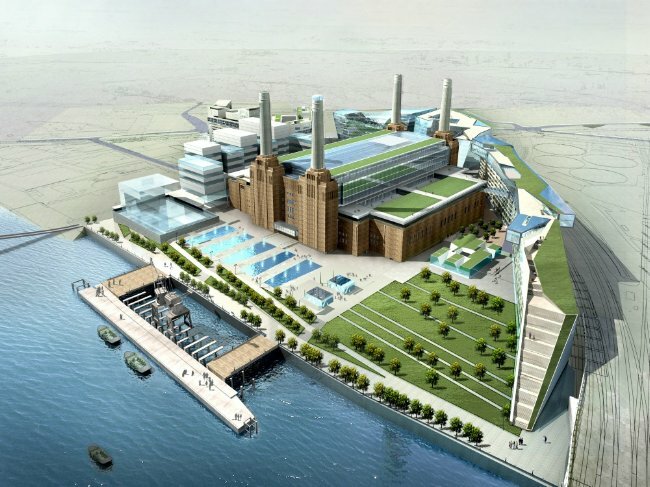 Angry activists are fighting plans to replace Battersea Power Station’s iconic chimneys. The Grade-II listed building’s new owners plan to replace them with replicas. Fears that corrosion could cause the existing chimneys to collapse led to the controversial decision. Architect Keith Garner, 53, said it would cost approximately £10m to replace each chimney, four times more than to repair them. The representatives of the Battersea Power Station’s developers strongly refute this £10m estimation, and claim the estimated cost to replace all four chimneys will be £11m. Mr Garner, of the Battersea Power Station Community Group, has campaigned to preserve the art deco landmark since 1993. “It’s an ugly, horrible scheme – a monoculture of private flats. I see nothing really for ordinary people in this part of Wandsworth at all. “I was born in Wandsworth and have lived in Battersea since 1986. My parents met in Battersea Park, so I’m very closely attached to the area,” he added. A Malaysian consortium of S P Setia, Sime Darby and the Employees Provident Fund bought the 39-acre south-west London site in July for £400m. Construction will begin by mid-2013, they announced this month. The £8bn project includes an extension to the Northern Line, restoration of the power station site and the construction of 3,400 homes. A public six-acre park, linked to Battersea Park, is also on the cards. The revamp is expected to take up to ten years to complete, creating 26,000 jobs. Phase one includes plans to build 800 homes above a commercial complex featuring shops, offices and restaurants. Wandsworth Council granted outline planning consent for the scheme in 2011. Council Leader and co-chair of the Nine Elms Vauxhall Partnership Ravi Govindia said: “The district-wide regeneration programme will be one of the greatest sources of new jobs and homes in the country over the next few years. “The redevelopment of the power station site has an important role to play and is key to funding the Northern Line Extension. “This is the most exciting development in London and will deliver a massive boost to the economy,” he added. The power station was built in 1933 and has not generated power since for over 30 years. A detailed application for the first phase of the project is expected next month. This entry was posted in Battersea Power Station and tagged A battersea, Battersea history, battersea its past its future, battersea park, Battersea Power Station, Battersea Power Station Community Group, Keith Garner, London Power Company, Northern Line, Parkview International, Wandsworth, wandsworth council by clockword. Bookmark the permalink.